The folks at Soundbrenner thought I’d want to try it out for a review and sent me one along with the large body strap. There were two things I was interested in testing with the Pulse: How could I integrate it with my DAW REAPER, and also could it get me into a good habit of practicing guitar and bass again. Physically it’s about the size of an Oreo, that can be worn on a wrist, arm, leg or chest depending on which strap you use. The face is touch sensitive and lights up with each pulse/vibration, an illuminated ring for quick adjustments of tempo surrounds the Pulse. It comes in some really slick packaging. Not as minimal as an Apple product but a similar really nice experience opening it for the first time. In the box you get the pulse, the charging dock, a micro-usb cable, two adjustable straps (wrist and forearm/leg) that the Pulse snaps into, a guitar pick, two stickers and the instruction booklet. There’s a video below of the unboxing. The Pulse is controlled by gestures, turn the dial and press on the top to start up, two finger touch to start and stop, tap 3 times for tap-tempo. It’s all in the manual and when you start the app the first time. Within a few minutes of use it feels really natural. Many of the functions of the Pulse require syncing to your smartphone and their “The Metronome” app [ link ]. Things like time signature, different patterns, audible metronome, song mode, strength/length of pulses. You’ll want to use the app. I hoped the Pulse would help me get back into the habit of playing guitar and bass daily. Like every other piece of gear I’ve bought, it helps for a few days and then I go back to not playing for weeks. I don’t think it’s reasonable to expect a technology to correct self control problems, it’s a fancy metronome not a chastity belt! I’m going to pause writing for a bit and practice with it for a while. hold on. The Metronome app is pretty damn decent and I can see it being useful even if you don’t own the Pulse. Once you get the settings right you can pretty much put the phone in your pocket and do everything else from the Pulse gestures. I was finding it hard to have really tight timing with the default pulse setting. I set it to short and powerful and that helped for me. I also use the audible metronome in ear buds. With the Pulse you can set the volume significantly lower in headphones without struggling to find the beat. You’ll be able to practice for longer without the headache from a loud click track. I’m not able to go entirely without the audible click but perhaps that will come with practice. The app includes song and setlist functions that I have not explored very much. It seems that a song consists of a single tempo with one type of subdivision and accent pattern. Multiple songs can be put into playlists. I think it’s worth mentioning some things if you’d like to use the Pulse for recording. Second, the vibration isn’t silent, it can be quite loud. With electric guitars the pulses can be heard in the pickups if you want to wear the Pulse on your picking hand. You might have to wear it on your ankle, with the strength on medium. Still I don’t think I’d want to risk it for acoustic instrument recording with sensitive condenser microphones. The Pulse can also be used as a limited MIDI device. 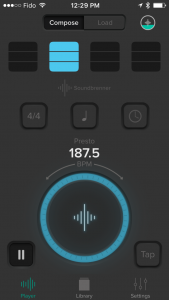 When synced to a DAW through another app: Soundbrenner DAW Tools [ link ] – you can receive the DAW’s MIDI clock, so the pulse vibes along with all your sequenced tempo changes. The Pulse can also send some MIDI to your daw for remote control. There are two requirements for the MIDI functions and the DAW Tools app to work. 1 – MacOS Yosemite or higher. No Windows support yet. My main studio iMac has an older Bluetooth device so I could only connect to my 2015 MacBookPro Retina. 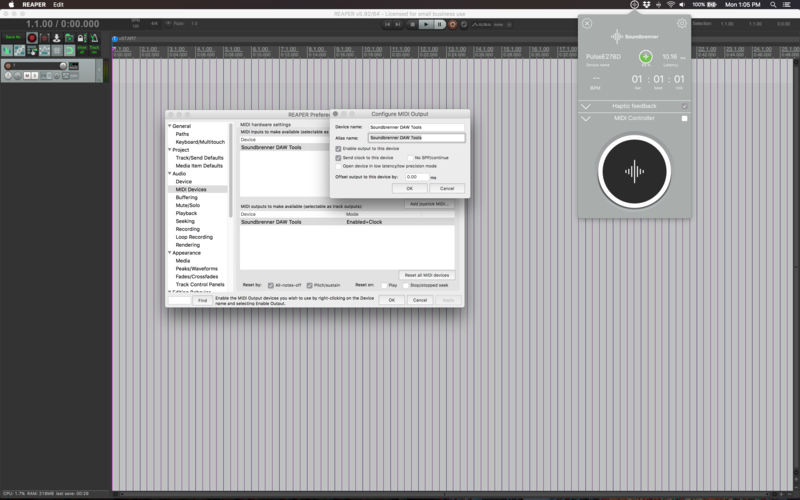 From there I was able to get the sync working pretty quickly in REAPER. 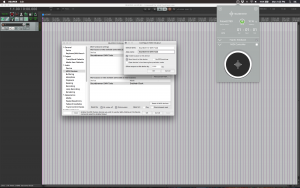 When DAW Tools is running in the notification bar, REAPER sees it as a MIDI device. Just enable sending clock to it and the Pulse receives the tempo from the project. If you enable it as a MIDI input you can assign its ring and touch functions to actions. One obvious action to link to touch is play/stop. That worked ok. Using the ring as a MIDI input was disappointing. Physically it’s an endless rotary encoder, in the software it sends an absolute value from 0 to 127. That severely limits what you can do with the ring. Jog/scrub, tempo changes, track volume I just couldn’t get working smoothly. I emailed my contact at Soundbrenner with a request for an increment/decrement mode where the clockwise sends 1, 2 3, and counterclockwise sends 65, 66, 67. REAPER’s MIDI link mode “Relative 3 (65=-1, 1=+1)” mode works great with that. At the time of writing this article that is not yet implemented but they said it’s something they’d like to do. MIDI control is not that big of a problem really and it’s unlikely to be the main reason you buy the Pulse. Using the above methods allow users with DAW running on Windows computers to also sync the Soundbrenner Pulse. Once connected, the Pulse will automatically sync with the rhythm in your DAW. Overall it’s been a very positive experience using the Pulse. It’s not perfect but it’s pretty darn nice. It’s small and light with intuitive controls and good smartphone integration. As well, the Soundbrenner team was very responsive to my pre-review questions and feedback. I’m going to keep using it for practicing. The DAW connectivity seems to be something they’re focusing on improving and hopefully things like Windows support, increment/decrement mode come before long. It’s a unique and interesting product with good execution and I think it’s priced very well at $99 USD. Well done Soundbrenner! This is another example of the amazing products that are becoming available to augment the player experience. I’m always on the look-out for something that may add value to the recording experience and I was particularly interested in the MIDI function that could be synced with the DAW’s midi clock. 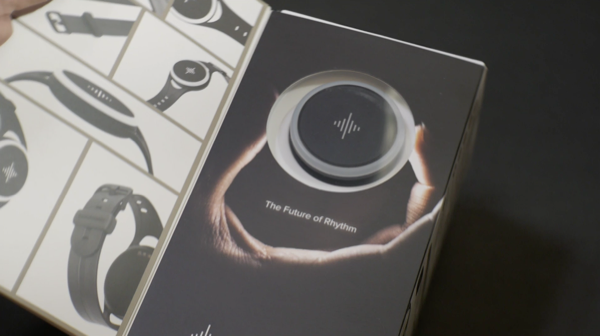 Even at its price of US $99, if it can provide some of platform someone who might have a sub-standard sense of timing it might overall help that person improve their rhythms. I was going to ask you about the multiple tempos section in your review and whether the experience was decreased when you tried to save the tempos or whether the pulse just had no capability? That would mean that you probably wouldn’t want to use something like this if you were in a progressive rock band I imagine? I was also particularly interested around the silent mode you mentioned – so it’s a silent mode, yet the vibration is loud enough that you would want to shift its location to your ankle? Is it as effective when positioned there and did it have an influence on your playing particularly when recording acoustic guitar?